What Should I Do With My Multiple Identities? While bouncing around some of my older posts the other day, I saw a question in the comments that went something like this: "I have several different identities online. How should I handle those while building my online platform?" That is an excellent question, but my first answer would be: Don't create several identities in the first place. A lot of writers are so ready to be someone else that they feel the need to create pen names like crazy. I'd advise against doing this unless you are in a situation in which it is completely necessary. For instance, I met a poet in Austin earlier this year who created a pen name because his job as a professor prevented him from publishing anything (including poetry) under his name unless it was approved by the university. I can understand changing your name under such circumstances. I can also understand creating a pen name at the suggestion of an agent or editor to help with sales. However, I don't understand creating several identities without a good reason. It can get really confusing really fast. That said, the best way to handle separate "brands"--because that's what you're essentially creating--is to have separate platforms. This means each persona should have a separate website, blog, social media accounts, etc. It's a lot of work, but there are ways to make it easier. But like I said, I think life is a whole lot simpler when we can just be ourselves 24/7. Or follow my page on Facebook. And don't forget to sign up for e-mail updates on the right. Multiple Personality Disorder from the Inside Out , by W. Giller, Barry M. Cohen, Esther Giller and Lynn W.
Many writers I know are allergic to statistics. When these writers get too close to a statistic, they tend to exhibit one (or more) of the following symptoms: headache, drowsiness, nausea, blurry vision, irritability. Personally, I've never had this problem with statistics. Earlier today, I decided to play around with the design of my blog and check in on my own statistics. (By the way, you can sign up for e-mail updates over on the right.) What I found was interesting--to me anyway. There were a few others in there too, which is why those numbers don't add up to 100%, but these were by far the most common. I remember when IE was far and away the top dog, so it's interesting to see the other three creeping up. First, I'm glad that people who are searching for Robert Lee Brewer and My Name Is Not Bob can find this blog. Second, I'm surprised that people find my blog when searching for the best Christmas albums and best meatloaf ever. I'll take what I can get, I guess. They do; they do, though not as much as some people would have you believe. Knowing trends and past performance is important for figuring out what has worked in the past and what may work in the future. However, I don't think it benefits most bloggers to sit around monitoring their stats day and night. How can I improve my blog traffic from other sites? Maybe there are ways to use Twitter, Facebook, or LinkedIn more effectively. Maybe there are ways to improve SEO for search engines like Google. How can I keep that traffic engaged on my blog? Maybe there are certain topics that just naturally draw more interest than others. Think about what they share in common. Of course, you may also need to increase the frequency of your posts. For me, I know that I should probably start really hammering away on amazing Christmas albums and meatloaf. Or follow my fan page on Facebook. And sign up for My Name Is Not Bob delivered straight to your inbox by entering your e-mail address in the box on the right. Okay, I know putting together a list of my own favorite books opens me up to criticism, but whatever. The following books are my faves. It's, of course, super hard to assemble a list of favorite books, so I made it a little easier on myself by breaking the lists into three categories: prose, poetry, and children's. The categories didn't make it a whole lot easier, but it did make selecting books a little bit more of an apples to apples experience. If you think I made any crazy omissions, I'd love to hear your thoughts in the comments below. Who knows? Maybe I just haven't read your favorite books yet and will eventually see the light. The Little Prince , by Antoine de Saint-Exupery. This is my favorite book, and I read it every year or two to learn something new about myself and the world around me. Birds of America: Stories , by Lorrie Moore. Moore is my favorite short story writer. She has the ability to make me cry and then with a sparkling one-liner get me back laughing. As I Lay Dying , by William Faulkner. I love segmentation in stories when done well, and this is the text book of telling a story with multiple narrators. The Catcher in the Rye , by J. D. Salinger. Some books grab me because of the story they tell, while others hook me with their characters. This book has one of my favorite narrators ever. A Good Man Is Hard to Find , by Flannery O'Connor. No one is safe in O'Connor's world of fiction. If you don't have your guard up, then you're bound to get bamboozled. View With a Grain of Sand: Selected Poems , by Wislawa Szymborska. Every poem in this collection seems to either transport me or surprise me or both. The Darkness Around Us Is Deep , by William Stafford. Something about Stafford's voice allows him to take me by the hand and show me the world I know in a different way. Paterson , by William Carlos Williams. I love WCW's shorter poems , but this epic poem held me from beginning to end--and I'm not a person easily impressed by long poems. Transformations , by Anne Sexton. Tammy and I both love Anne Sexton's poetry, and this is my favorite of her collections. The Captain's Verses , by Pablo Neruda. If you want to woo and woo right, then you should probably read this collection of love poems. They are the nuclear bomb of woo. The Monster at the End of This Book , by Jon Stone and Michael Smollin. The lovable, furry Grover reads the title of the book and tries to keep the reader from reaching the end (and the monster). Will he succeed? Dinosaur vs. Bedtime , by Bob Shea. I love this book, because it affords me the opportunity to roar right before bedtime. It's a super fun book--as is the sequel: Dinosaur vs. the Potty . Where the Wild Things Are , by Maurice Sendak. It's not the wordiest of books, but it's still a classic for a reason. Dr. Seuss's Sleep Book , by Dr. Seuss. When I'm ready to close the deal (on getting Will to go to sleep), I break out this baby. The rhymes and characters are great, but it's super long and--usually--puts Will out for the count before I reach the end. Corduroy , by Don Freeman. A little stuffed bear named Corduroy wants to find a friend and decides all he needs to do to make that happen is find his lost button. Okay, these are my favorite books. What do you think? Or even become a fan on Facebook. In a previous post, I provided SEO Tips for Writers, but I don't think I've ever really discussed why writers should care about SEO. To many writers, SEO sounds like something that would only be of interest to businesses, online marketers and programmers. While those parties do often care about SEO, it's important for writers too, especially if they want to find a larger audience for their writing. Beyond building an online platform, good SEO just makes it easier for people to learn more about writers if they see references to the authors, their articles, or their books. When I read an amazing poem in a literary journal, I'll usually flip to the back of the journal to learn more about the poet. Smart poets include their website or blog address in their bio notes. If there's no web location included in the bio note, I'll do a search online. If the poet does not have an optimized site or blog, it may not come up in the first page of results. This is problematic. Why is bad SEO problematic? When I can't find more information on a specific writer, I can't ask that writer to promote her writing through an interview or offer him an assignment in one of my Market Books. It's a lost opportunity at passive marketing and income. Writers should always focus on their writing first, but that doesn't mean they should completely ignore ways to make it easy for them to find an audience. The beauty of good SEO is that a writer often doesn't have to work harder, just be a little more thoughtful about how they post content online. While many people in the ATL were heading (or getting ready to head) into work, Tammy and I were checking in at Northside Hospital in Sandy Springs. We were expecting a baby girl before lunch time. Hannah enjoys her last few hours in Tammy's belly. It's funny how nervous I used to get before each baby. While I was still a little on edge that nothing crazy happen during THE EXTRACTION, the rest of it felt routine. We strolled into the hospital together as if we were just there for a regular check-up. Then, we cracked jokes and killed time in a small room until Tammy's uncle showed up to give her epidural. Tammy carries babies low and sideways and, as a result, usually receives a lot of comments from random strangers about how it looks like she's about to pop--or that she must have a really big baby. This time around even Tammy was starting to think she might have a larger than normal baby, and she was right. Enter Hannah Marie Brewer! The pretty little girl is also a chunky little girl. 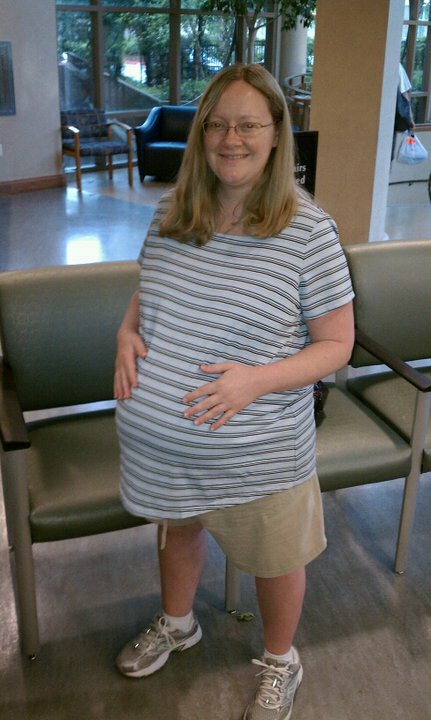 Since Tammy was getting a C-section, she had a blue screen up between herself and the rest of the room. As she told it to me: "I felt her pull out and then heard everyone say, 'Whoa!'" 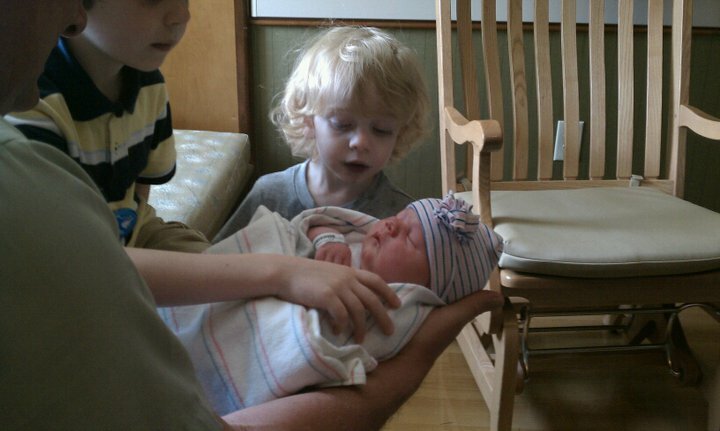 We all said, "Whoa," because Hannah was 9 pounds and an ounce at 20 inches in length. 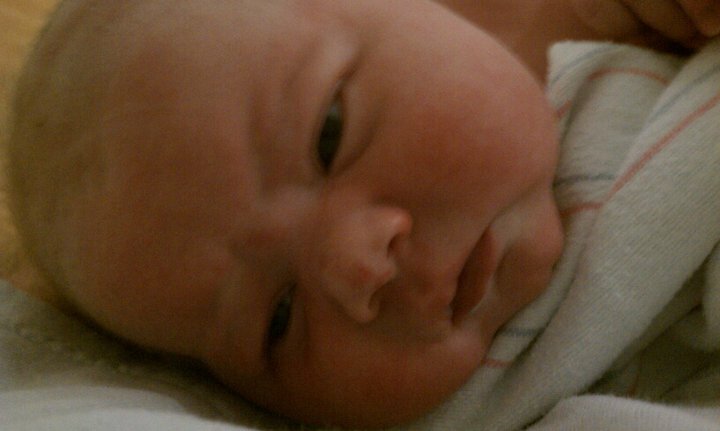 Her cheeks were so chubby that aunts and grandmas were lining up throughout the hospital to pinch them (poor girl!). Hannah's two oldest brothers (Ben and Jonah) are up in Ohio until mid-July, but they were able to check out pictures of their little sister on Facebook. Her other two Georgia brothers (Reese and Will) were able to visit the same day. 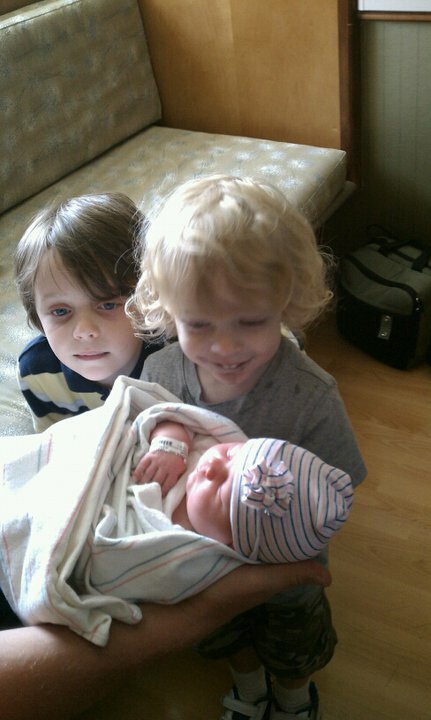 Reese and Will with baby sister. So careful. Reese waited outside the nursery until Hannah was transported to our room. He said, "I'm not leaving until she does." Will seemed to toggle between excitement and unease with Baby Hannah--until she made it back to the room and he saw how excited Reese was. Will is a little Reese shadow, so if Hannah's good for his brother, then she's good for him. Tammy's recovery has been great, and she's tough enough that she walked the floor three times on Friday. By August, she'll probably be doing crunches and kickboxing, because she rocks like that. Tomorrow, we hit the pediatrician's office. He'll likely tell us she's a normal boring baby and to cut her fingernails. Tammy and I love our pediatrician (Dr. William Moneit). When we were considering moving last year, we both actually talked about how we would miss having him as a pediatrician. Hannah Marie Brewer has officially joined our family, and she's been an absolute joy. She sleeps well, seems very laid back like her brother Will was, and is very, very cute! What a wonderful way to experience Father's Day weekend! Baby Einstein Gift Pack Volume 1 . Tammy calls these DVDs "baby crack," because babies just watch the animals, puppets and toys and/or listen to the music. Veggie Tales: It's a Meaningful Life . I love the Veggie Tales movies, and this one is a "veggie" take on my favorite movie: It's a Wonderful Life! Good music and great lessons. Fisher-Price Brilliant Basics Rock-a-Stack . Anything that involves stacking is a winner with the young ones. I'm pretty sure Hannah will stack 'em just as well as her older brothers. A plush baby rattle . Something snuggly and that makes noise is a baby pleaser if I've ever heard one. As technology makes it easier for writers to build a platform and hide away from the world, many writers are doing just that--using technology as an excuse to avoid face-to-face networking opportunities. I'm a bit of an introvert myself, so I totally understand this impulse. However, it does limit the opportunities a writer can receive. Personally, I try to make it out to at least a few events each year. They are always fun, though I often panic before them and look for reasons to opt out. Make connections. You can make connections with speakers and event directors, but your fellow attendees are more than likely pretty interesting themselves. After the event, try to find and friend these connections on Facebook, Twitter and LinkedIn. Get inspired. I always leave writing events with ideas for my writing and my editing. Just being around other writers is good for the soul and sparks conversation. Learn opportunities. At most writing events, there will be people seeking submissions to their journals, presses, and/or contests. There may be people looking for guest bloggers and/or interview subjects for blogs. I usually leave writing events with more than five solid publication leads. Find answers. The introvert in me knows how difficult it is to ask questions of complete strangers, but it's important to do so. Most people at writing events are there to help and encourage (whether they're speakers or not). They want to help, and writing events are a great place to finally get answers to serious and off-the-wall questions. So ask away. Okay, so those are some textbook reasons why I think writing events are beneficial. To get a little more personal, I thought I'd look at some recent events in which I've participated and show just how much I get out of each event. Red Clay Writers Conference, Kennesaw GA, November 12, 2010. I was invited to speak at this event through a Facebook connection. I spoke on building a writer platform and attended a session on blogging and one on memoir writing. In addition to learning about some publication opportunities, I also made connections with freelancers who I used for both the 2012 Writer's Market and Poet's Market books. Plus, I interviewed one audience member for my Poetic Asides blog and received an invitation to speak at the Blue Ridge Writer's Conference from a person who attended my session. I should also mention that my blogging strategy at MNINB shifted dramatically after this conference. Blue Ridge Writers Conference, Blue Ridge GA, April 1-2, 2011. As I mentioned, I was invited to this event by a person who attended my session on platform building during the Red Clay Writers Conference. In fact, I presented on the topic again here (with a few updates) and also presented on how writers can find markets for their work. On the night before the actual conference, I also read some poetry. Anyway, I learned more publication opportunities at this event, made some new connections that have already resulted in a webinar and may turn into more speaking and freelance opportunities. Austin International Poetry Festival, Austin TX, April 7-10, 2011. Interestingly enough, I was invited to this event through a Facebook connection as well, which just goes to show you how important having a multi-dimensional platform building strategy can be. I was a National Featured Poet for this four-day event, which meant I was running from venue to venue reading poems, making connections and talking poetry. As with every other event, I learned new publication opportunities. I've also been invited to read poetry as part of the Houston Poetry Fest in early October and have been featured as Poet of the Week on an AIPF member's blog. Plus, there are a few other opportunities still cooking. So that's a 6-month snapshot of events and how they've led to other events and opportunities for me. Granted, I already have an established platform that I'm continuing to build. However, writers who are building their online-only platforms need to recognize the importance of in-person networking as well. If you're only doing one or the other, you're really missing out on so many opportunities to reach new audiences, readers, and even income. Or like my fan page on Facebook. Around the end of last month, I posted about the importance of revision, but I didn't really share any revision techniques. This post should help remedy that deficiency. All writers have their own writing strengths and weaknesses. For instance, I tend to use the word "that" too often in my first drafts. As a result, I look for ways to remove "that" from my writing more than about any other word. Revise big stuff first, make small edits later. This doesn't mean you should not correct obvious typos and grammar errors as you notice them. However, you shouldn't be actively tinkering with word choice until after you've nailed down the structure of your piece. To make this process much easier, I recommend using an outline for your fiction and nonfiction. Put the manuscript down and walk away. Writers need at least a little distance from their manuscripts before jumping into revision. Sometimes it takes a good night's sleep or a weekend-long vacation. Some writers require months of separation before they can look at a manuscript with fresh (and hopefully objective) eyes. Scan the whole manuscript without reading. I recommend doing this at the beginning and at the ending of the revision process. Scanning can make big problems more obvious that a writer might not notice when reading closely. For instance, maybe most sections are the same general length--except for one section that is significantly longer or shorter than the rest. Read carefully. Take your time and read every word. Then, read it out loud too. This will help you catch obvious errors. In particular, pay attention to transitions from paragraph to paragraph, scene to scene, stanza to stanza, etc. Check for repetition and consistency. Look for ways to be more concise with your language. Can you turn a 15-word sentence into a 8-word sentence? Can you turn an 8-sentence paragraph into a 5-sentence paragraph? And so on. Less almost always means more for the reader. Use active voice over passive voice. There may be occasions for using passive voice, but don't let yourself get drunk on the stuff. Passive writing makes for passive reading. Vary sentence structure. Don't fall into the trap of always writing: Noun + Verb + Noun = Sentence. Even if it's grammatically correct, using the same pattern over and over again will make your manuscript boring. Don't feel like you have to get crazy creative with your sentence structure; just check that you're not falling into a monotonous pattern. Save each round of revisions as its own file. Start with the first draft. Then, the second draft. Then, the third draft. Then, well, you get the idea. Saving these files may help if you realize a path you chose in revision ultimately leads to a cliff without a rope bridge to cross. Have someone read the manuscript. The more eyes (otherwise known as "readers") the better, because they'll be more objective when reading, and they're less likely to make "leaps of logic" that a writer might. Ask them for feedback on how the piece reads (fast, slow, awkward, etc.) and if there are any places that didn't make sense. Print the manuscript for a final edit. I edit Writer's Market , which is a huge book, and I love that I waste far less paper now than I did in the year 2000. Most of my edits are on the computer screen. That said, I do have a print out made for me and my proofers when it's time to do the final editing, because there are things I catch on paper that I don't on the screen. If you use these revision tips, you'll be ahead of the game in your revision process. However, I'd love to hear any other tips or rules writers live by when tackling revision. Share them in the comments below. Merriam-Webster's Collegiate Dictionary , by Merriam-Webster. Roget's Super Thesaurus , by Marc McCutcheon. The Elements of Style , by William Strunk and E.B. White. The Chicago Manual of Style , by University of Chicago Press staff. While going through the 2012 Writer's Market articles (book will hit stores in Fall), I was reminded of one of those things that I know, but that I sometimes forget, and that many potential authors don't realize, because they're not involved in the book publishing industry: Writers need more than just a great book idea to get a book published. Many writers (and I don't blame them) think that it just takes a great idea to get a book published, and that may be the case if writers and readers and publishers were to live in vacuum in which money doesn't exist. However, the evil that is money is an important factor in how book projects are ultimately given life or killed. Create a concise description of the book in one sentence (or in 30 seconds of talking). This is one of the most important tools to communicating your book to agents, editors, publishers, marketers, sales reps, book buyers, readers, etc. Of course, your book is more complicated than one sentence (or a 30-second description), but we live in a world in which people digest information in quick bites. Develop an amazing title. There are many ways to choose a title, but I suggest going over all the bestselling titles of the past year and looking for inspiration and ideas there. When writing nonfiction, it's usually a good idea to go either humorous or helpful. When writing fiction, use the title to evoke a mood or hint at a mystery that the reader must solve (by reading your awesome novel). Show how yours is different. Maybe your nonfiction book tackles the subject in a new way or has a different slant. Maybe your novel has a new twist or is set in a new environment or somehow incorporates teenage zombie magicians or something. You want a unique selling point that is still in the same ball park as an established success story. This may sound impossible (or very challenging), but it's a simple step-by-step process that helps you define your book and your audience better. If you understand your reader better, it only makes you more confident as a writer, because you know what they want and how they want it.